ANAHEIM, Calif. (MuseWire) – WINTER NAMM: Korg USA announces the King Korg analog modeling synth. Focused on live performance, it features Korg’s new XMT (Xpanded Modeling Technology) engine, with many types of oscillators and filters that can accurately model sought-after vintage analog synths. With its controls laid out in easily identifiable sections, King Korg delivers the unique characteristics of a dedicated synthesizer, while remaining approachable to players who are new to synthesizers. It not only shines on stage with high quality sound, but also with a champagne gold finish befitting its royal name. A 3-oscillator, 2-timbre design allows players to generate thick and rich sounds. In addition to essential waveform choices such as sawtooth, square, sine, triangle, and noise, King Korg provides pre-set algorithms that contain various combinations of oscillator numbers and types, for easily and quickly sculpting stage-ready sounds. The oscillator algorithms also include numerous PCM/DWGS algorithms for creating highly personal sounds. The filter section is crucial to a synthesizer’s character, and King Korg’s filters add unparalleled flexibility. In addition to a variety of essential analog modeling filter types, there are faithful filter models from analog monophonic synths that were used for lead and bass sounds in the ’70s, as well as the polyphonic synths used in new wave music of the ’80s, plus the filters of Korg’s classic MS-20 analog synth. These filters can also be made to self-oscillate by raising the resonance setting- a unique capability of analog synthesizers. A selection of 200 stage-ready preset programs includes many familiar and authentic sounds for playing classic and modern songs, plus fresh, inspiring sounds for new musical creations. An assortment of live performance staple sounds includes PCM-based piano, electric piano, organ, and clavinet. Users can store their own creations in 100 onboard user sound locations. Each of three master effect sections offers a choice of six effect types: PRE FX such as distortion and amp simulator; MOD FX, including phaser, chorus, and tremolo; and REV/DELAY such as hall reverb and modulation delay. A full-analog vacuum tube driver circuit is also included as a mastering effect. It can be used to add warm fullness, a powerful overdrive, or anything in between. In addition, a built-in, full-featured vocoder uses audio from the onboard mic input to create a talking effect. Many classic synthesizers used patch cables to physically reconfigure the signal flow. King Korg’s intuitive Virtual Patch system reproduces this function. With six Virtual Patch assignments per timbre, control signals such as EG, LFO, or joystick movement can be virtually connected to sound parameters such as pitch or cutoff, allowing users to modulate a parameter for even greater sound-shaping possibilities. King Korg’s design makes it easy to create and modify sounds. The oscillator section has its own dedicated display, and the control knobs are assigned to the most important parameters for each oscillator. There are also dedicated dials for each of the three master effects, making it easy to audition different effects to hear how they modify the sound. Self-luminous organic EL displays are used for excellent visibility, even on a dimly lit stage. King Korg features five octaves of velocity-sensitive keys, with adjustable response (Normal, Shallow, or Deep) to mimic that of classic instruments. Below the dedicated octave shift buttons, a backlit X/Y joystick is ready to control important live performance tweaks. A CV/GATE OUT jack enables players to use an analog signal to control a KORG monotribe or MS-20. A dedicated cable is included to use the keyboard of King Korg to play the monotribe. 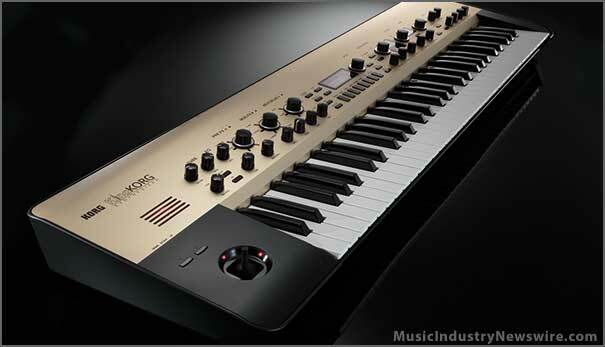 The King Korg will be available February 2013 for a U.S. Street price of $1299. Additional product information and sound demos are available at korg.com.